How evangelicals are taking advantage of publicly funded spaces. This article was reported with support from the Economic Hardship Reporting Project. On a Sunday morning in July, a stream of cars motors up the scrub-oak-lined roadway that leads to Apopka High School. Passing under a marquee sign with Chick-fil-A: Outstanding Partner in Ed spelled out in black letters, they pull into the parking lot. Single adults, families and groups of teens gather in the school auditorium’s spacious vestibule. Two adolescent boys, one wearing a sports jersey and the other a Confederate-flag T-shirt, linger for a few moments by their truck before making their way inside. Like it or not, the fusion of church and school that takes place in Apopka, Florida, is an increasingly common phenomenon in the United States. Indeed, a number of national and international franchise networks are dedicated to planting churches in public schools across the country, sometimes providing services that fill in the vacuum left by the government underfunding of public education. The mingling of church and school has also been encouraged by some poorly understood but profound changes originating in recent Supreme Court decisions about the relationship between religion and public education. As far as the leaders of Venue Church are concerned, these changes are all to the good. A recent graduate of Apopka High School, whom I’ll call Daria, agrees to show me around town. Daria is pale, with hazel eyes and the serious, reserved manner of someone whose life hasn’t gone according to plan. The landscape of Apopka is a strange jumble of past and present. The bumpy roads and boiled-peanut stands of the Old South give way to resurfaced highways and big-box stores. Nurseries and citrus groves dot the region; locals sometimes refer to it as “America’s Greenhouse.” Turning into South Apopka, the poorest neighborhood, we pass one church after another. Until 1968, a municipal ordinance restricted black Americans to the south side of Apopka’s railroad tracks, forcing them to live in this ramshackle neighborhood of just a few square miles. FBI records have shown that the Apopka Police Department included members of the Ku Klux Klan as recently at 1991. Daria says, “I was really surprised when I heard that people in Los Angeles were protesting over Trayvon Martin…. It was just business as usual [here].” In South Apopka, “there were almost no services,” Daria notes, “and many roads are still unpaved.” In such communities, the church is often the only entity offering residents practical assistance, including food, childcare and other necessary forms of aid. Despite Apopka’s divisions, there’s one thing everyone agrees on: football. The high-school team claimed a state title in 2001 and again in 2012 and 2014. Rick Darlington, the team’s charismatic coach, is a local hero. In addition to building school spirit, the team serves as a way to bring lower-income boys into the life of the school. If they do well, they have a chance at an athletic scholarship. The Fellowship of Christian Athletes, a youth-focused evangelical group with almost $88 million per year in revenue, has a very active chapter at Apopka High School, with which Darlington is involved. The fusion of church and school comes at a time, not coincidentally, when public schools are under severe financial pressure. In Florida, the election of Tea Party and other “small government” officials has resulted in drastic spending cuts. Orange County has suffered more than $105 million in budget cuts since 2007—devastating losses that have curtailed school administrators’ ability to hire staff, maintain their facilities and fund extracurricular activities. At Apopka High School, the cuts have been felt deeply by students, who complain of overcrowded classrooms, insufficient textbooks and supplies, and lack of funding for “extras” such as music and drama. In 2012, facing steep budget cuts, Orange County Schools Superintendent Barbara Jenkins announced an expanded outreach to faith organizations. “Our missions to better our community dovetail when churches, synagogues, mosques, and all faith-based organizations harness the power of volunteerism and servant leadership to benefit the region’s youth in schools,” she announced. Jenkins’s plea was purposely nonsectarian—and yet the “faith partners” for Orange County’s schools are nearly all evangelical Christians. “There are a lot of churches that meet in a school,” Lamphere pointed out on a local Christian cable-TV show, The Good Life. “What we’re saying is that we’re going to meet permanently in a school…. We’re not looking to build a building; we’ll never be in debt.” The “soft” establishment of evangelical Christianity at Apopka High School has now become a rather hard matter of dollars and cents. 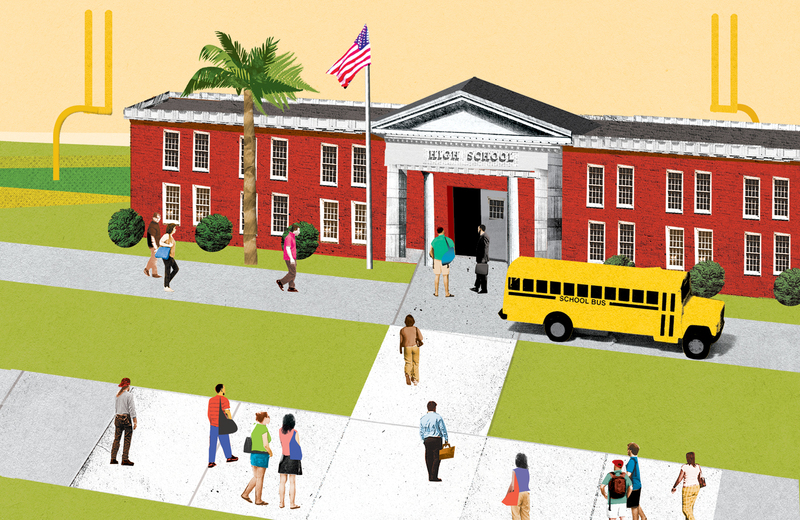 Far from an isolated incident on the border of church and state, Venue Church’s involvement in Florida’s public schools is part of a national trend. In the evangelical world, the past twenty years have seen the rise of a franchise organizational model, in which a single national or international entity works with local “religious entrepreneurs” to install churches in public-school buildings, or in other relatively affordable facilities like movie theaters, rather than fund its own buildings. Venue Church appears to be independent, but other churches in public schools are more closely allied with broad evangelical networks. Thirteen miles away, the Celebration Orlando Church, located in Howard Middle School, is part of the Association of Related Churches, a Birmingham, Alabama–based network that works with “church planters” to assist them in launching and expanding new churches. In 2006, ARC planted nine; in 2009, it was averaging around fifty new church plants per year. Today, with a more developed structure, ARC is training and coaching hundreds of church planters annually. Evangelical networks that have planted churches in public schools across the United States include Redeemer, Vineyard, the Evangelical Covenant Church, Sovereign Grace, Victory Outreach, Morningstar and many dozens of others. Acts29, a Seattle-based evangelical coalition that has started 350 churches across the nation in the past five years, estimates that some 16 percent of its church plants meet in public-school spaces. A 2007 national survey by LifeWay, a Christian research agency, found that 12 percent of newly established Protestant churches met in public schools. Today, that number is surely higher. In many cities, just about every public-school auditorium is rented to a church plant on Sunday morning. In some places, houses of worship have operated inside public schools for years without paying any rent at all—a situation that, in New York City at least, has led to an ongoing battle in the courts. Even when rent is paid, the arrangement is a boon for churches, which are able to obtain safe and comfortable facilities, as well as furniture, heating and air-conditioning, and other benefits, for a fraction of the cost of financing their own facilities. This phenomenon has given rise to organizations such as Kids Hope USA, which “equips [churches] to mobilize into the schools.” Kids Hope USA has made possible over 1,000 partnerships between churches and public schools. The program it facilitates consists of tutoring and mentoring. Participants in such partnerships are supposed to abide by a strict separation of church and state and refrain from proselytizing. What does partnership look like for Oak Cliff? Church representatives implement a “Kingdom Agenda Strategy” by acting as student mentors, participating in academic tutoring and character-education classes. The latter include abstinence-until-marriage teachings and promote a narrow, religion-driven idea of what constitutes an acceptable moral life. While many of the church groups in public schools market themselves as “nondenominational,” evangelicals of a generally conservative type overwhelmingly dominate this new field. The leading groups are committed to the inerrancy of the Bible. Some, such as Morningstar, draw heavily on Dominionism—the idea that Christians should seek to dominate all aspects of secular politics and society until the return of Jesus Christ. Mark Driscoll, a controversial founder of Acts29 who left the organization after scandals involving allegations of plagiarism and psychological abuse, is known for his unapologetic commitment to male-centered authoritarianism. “We live in a completely pussified nation,” he has said. The new interest of these groups in public schools reflects a significant shift in missionary strategy. It is now accepted wisdom that the most fruitful targets of their efforts are young children, who are thought to be more susceptible to conversion. The focus on schools stems in part from the realization that students, especially in the younger grades, invest a lot of authority in their school, and typically can’t distinguish between what is taught in the school and what is taught by the school. Beginning in December 2012, the Freedom From Religion Foundation sent a series of letters complaining of multiple church-state violations at Orange Country public schools, of which Apopka High School is one. A March 2014 letter cited the involvement of school officials in promoting religion in athletics, the Bible verses printed on sports jerseys and athletic-field banners, and, of course, the presence of Venue Church. In May 2013, after a group called World Changers of Florida distributed Bibles in the school, the FFRF attempted to distribute material promoting secular humanism. But the school blocked that effort, leading the FFRF to file a civil suit. “They censored us, so we sued them and won,” Seidel says. In fact, however, the FFRF was prohibited from distributing most of its materials. The FFRF’s actions haven’t changed the basic reality in Apopka. Stepping back from the details of this particular case, the real question is: How could this kind of entanglement between church and school ever have arisen under any reasonable interpretation of the First Amendment? The answer has to do with changes in the legal landscape, which have been in the making over the last thirty years. The religious right has invested in legal-advocacy organizations that promote a certain version of Christianity in public life and seek to destroy the separation of church and state. The American Center for Law and Justice, Liberty Counsel, the Alliance Defending Freedom and other such advocacy groups have combined budgets of more than $100 million per year—and they have public schools in their sights. The legal theory that these groups promote, which makes possible the rise of church-school partnerships, hinges on several key arguments. The first seeks to collapse claims about the freedom of religious exercise into claims about the freedom of speech. The second argument makes a strict distinction between private speech and publicly sponsored or official speech. The third drastically minimizes the weight of peer pressure or social coercion. And the fourth conceives a lack of religion as just another religious view among many, and therefore not to be favored over other religions. When you put these premises together, you end up with the conclusion that including religious groups in school does not involve an establishment of religion in any meaningful sense, whereas excluding them does involve the violation of their free-speech rights and thus represents discrimination against religion. Justice Clarence Thomas ably sums up this line of argument in a key 2001 Supreme Court decision, Good News Club v. Milford Central School. On the one hand, he dismisses the idea that kindergartners might falsely perceive the private speech of religious groups operating in the school as coming from the school; on the other, he asserts that banning these religious groups from school might be perceived by the community at large as discrimination against religion in favor of secularism. In his opinion on the case, which he delivered for the Court majority, Thomas singles out another case to be reviewed in light of the Good News Club decision. That case, Bronx Household of Faith v. Board of Education of the City of New York, involves more than sixty churches that were at one time operating inside New York public schools on a rent-free basis. The city’s Department of Education argues that it shouldn’t be subsidizing and managing a large network of religious organizations, nearly all of which are evangelical. Legal advocates for the churches in question argue that prohibiting them from operating in schools is a violation of their free-speech rights. That case has been fought in the courts for nearly two decades. In the past, the Alliance Defending Freedom has aimed to push it all the way to the Supreme Court, although it is unclear whether the case will ever appear on the Court’s docket. For the time being, there can be little doubt that there is an established religion in Apopka High School. “There’s a ‘right’ religion here,” Daria asserts as we drive back from South Apopka, with the ramshackle houses giving way to the sleeker constructions of the north. A man stands by the side of the highway with a sign that reads: Jesus Is Coming. Are You Ready? Katherine StewartKatherine Stewart has written for The New York Times, The Guardian and Religion Dispatches. She is the author of The Good News Club.